Throughout January and February 2019, excluding Valentine’s Day, we’re doing a special set lunch menu and early bird supper with two courses priced at £14.95 per person and three courses £18.50 per person. Served on Tuesday, Wednesday and Thursday lunch times and between 6pm – 7pm, we’ve small plates on our sample menu including our much-loved beetroot and goat’s cheese arancini, a hearty bowl of vegetarian homemade soup with bread or a Brixham crab, one of Donna’s favourites, with macaroni cheese and Parmesan. Mains on our sample menu include a tasty breast of chicken with mushroom pearl barley risotto, truffle oil, sprouting broccoli or you could opt for a vegetarian version with breaded Cornish organic Brie. There’s also a fillet of Newlyn hake with Bombay potato, curry sauce, roasted cauliflower, cauliflower puree or a warm salad of honey glazed confit duck, black pudding, new potatoes, honey glazed carrots, so plenty to choose from. 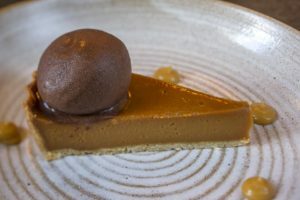 We’ve also popped on our specials’ sample menu some of our favourite desserts too such, as salted caramel tart, chocolate sorbet or milk chocolate cheesecake with burnt satsuma, orange marmalade ice cream and new season Yorkshire rhubarb and mascarpone. Please be aware before booking that the above dishes may change daily subject to ingredient availability. All our meals are served complete. To see our sample menu, please click here and to book, please get in touch here.